Crawling around behind-the-curtains at The Petersen Automotive Museum in Los Angeles, one of the first cars I noticed was a bright yellow De Tomaso Pantera. But this wasn't any Italo-American exotic. It was Elvis Presley's Pantera and it has the bullet holes from The King's revolver to prove it. Here's how they got there. If cars are our religion then the Petersen is one of our high holy sites and I had the pleasure of making a pilgrimage there a couple of years ago. Though the Pantera wasn't the rarest relic in the collection, nor the most beautiful, the story behind has been stuck in my head since and I've been wanting to tell it. Now that the car has been moved up from the secret confines of the museum's garage to the show floor where anyone can visit it seems like the perfect time to share with all of you. 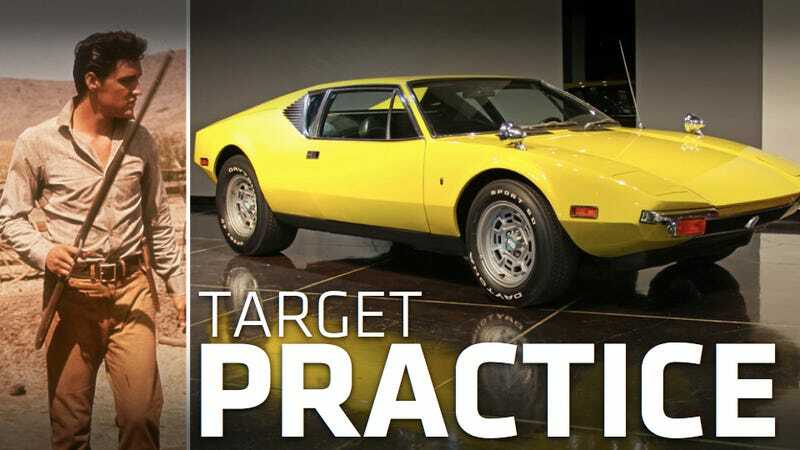 The Pantera was a considered a mid-engined exotic back in the early '70s when it debuted, combining Italian good looks with American muscle courtesy of a 351 Ford Cleveland V8. Elvis picked up this 1971 model in 1974 for his girlfriend Linda Thompson. As far as Panteras go this one appears to be fairly stock save for two key modifications, courtesy of one of Elvis many sidearms. Looking into the vehicle with a friend there was no missing them. Two holes in the steering wheel and one in the floor. Why would Elvis shoot a perfectly good car? According to the oft-repeated story told to me by the museum's Collections Manager Tom Kenney, Presley had just had a fight with Thompson and was hoping to leave with a furious burnout in order to make his point but the car wouldn't start. You don't show up The King. Even if you're made of metal. Presley then pulled out his revolver and shot the car through the door, hitting the steering wheel and the floorpan. Years later the car wound up for sale in a large collection with other some other exotics. A friend of the late Robert E. Petersen told him about the cars and he purchased the lot for his personal collection. "I was thrilled to get the Pantera," said Petersen. "Elvis' tantrums are well known and to have a vehicle associated with one of them makes our collection that much more special." You can see the car now on display at the Petersen, alongside the rest of the amazing collection and this month's special exhibit on Phil Hill. Just please leave your firearms at home. Special thanks to The Petersen Automotive Museum, Chris Brown, Tom Kenney, Leslie Kendall for the photos and information. More on Elvis Presley's Pantera can be found on the Pantera International website.